Women in the millennial workforce have lower aspirations to secure top jobs and less confidence in their leadership skills than their male counterparts, according to a recent report from Deloitte. That despite also rating themselves to be at least as good as, if not stronger than, their male peers when it comes to their professional, communication, and creative skills as they leave college and university. Evidence of this millennial gender gap came from the 2015 Millennial Survey. The survey questioned around 7,800 millennials from 29 countries about their views on “business, leadership and doing good.” All the participants were employed full time when they completed the survey. Three-quarters working in organizations with 100+ employees and 78 percent in the private sector. The gender gap appeared when respondents were questioned about their leadership aspirations with their current employer. Just 47 percent of women aspire to be number one in their organization compared to 59 percent of men. 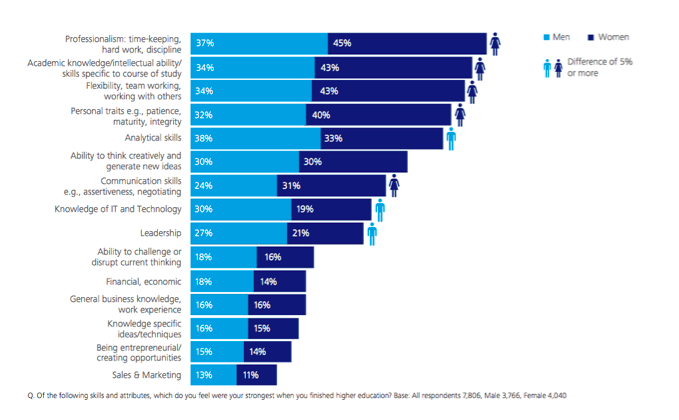 More women have ambitions to reach senior management (57 percent) but they are still outnumbered by men with the same aspirations (64 percent). When questioned about how they rated their overall leadership skills, just 21 percent of women gave themselves a “strong” rating, significantly down on the 27 percent figure for the men. That is somewhat surprising given the closer analysis of leadership skills illustrated in this graphic from the report. Women rated themselves as stronger than men in most skills with men only rating significantly higher in their analytical, financial, and IT skill set. There’s a clear dichotomy between female millennials’ lack of confidence in their overall leadership abilities, and how high they rate themselves in the skills vital for a leadership role: Communication, negotiation, assertiveness, and intellectual ability. Clearly, they felt pretty darn good about themselves as they were wrapping up their degrees and anticipating entering the workforce. Which begs the question — have these women experienced workplace situations which subsequently eroded their confidence? Team politics? Bad bosses? Limited opportunities? I think it’s more than that, and probably starts at childhood and has a lot to do with the way women are wired versus the way men are wired. Tara Sophia Mohr, founder of the Playing Big leadership program for women covers this topic nicely in an article written for the Harvard Business Review, Why Women Don’t Apply for Jobs Unless They’re 100% Qualified. It discusses a company who was focused on an initiative to get more women into senior executive positions and found there was a disparity in the number of women applying for positions within the company. When explored, it was discovered when women encountered a promotional opportunity, they only applied if they felt they met 100 percent of the job requirements. 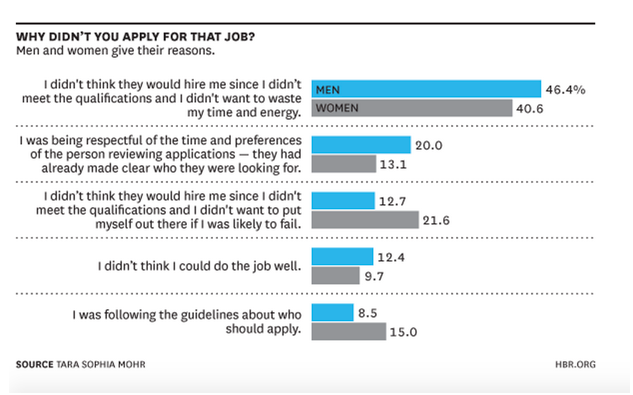 Conversely, men applied for those same opportunities if they only met 60 percent of the job requirements. Women follow the rules. Men go for it, no matter what. It’s important to note that women in the study didn’t indicate they failed to apply because they didn’t feel they were qualified, they were following the rules. Fascinating, isn’t it? Overall the Deloitte study concluded that as the millennial generation enters the workforce, a leadership gap is developing, with the new intake having different views about business than their predecessors. It’s no secret that the millennial generation has been a big factor in companies beginning to embrace relaxed hours, remote working, and flexible time-off policies. So it’s not surprising to see that millennials believe the focus of business should be on the wellbeing of employees, as well as its impact on wider society. Millennials’ perception, however, is that business leaders are more interested in personal rewards and corporate profits. 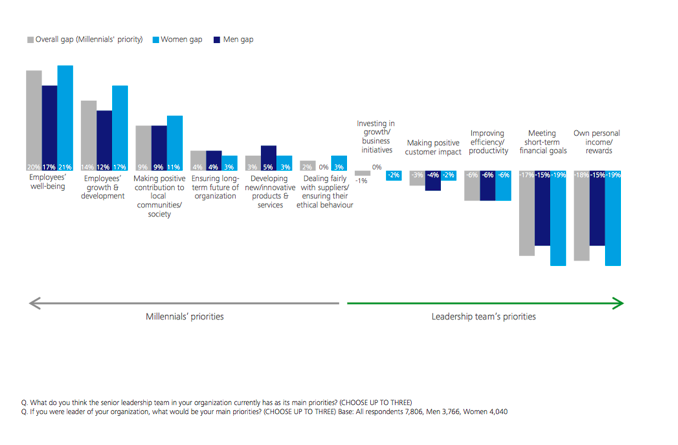 And when those perceptions were put to question: “What do you think the senior leadership team in your organization currently has as its main priorities?” and “If you were leader, what would be you main priorities?” the gender gap became even clearer. 46 percent of women highlighted employee reward and development as a leadership priority compared to 38 percent of men. A third of women strongly associate having development as a leadership priority compared to 38 percent of men. Millennial women say they would focus less on short-term financial goals and personal rewards than millennial men. Millennial women appear to value the needs of employees and the wider community more than their current leaders and indeed, more so than their male peers. It will be interesting to see how this feeds into future business culture as they enter senior management. 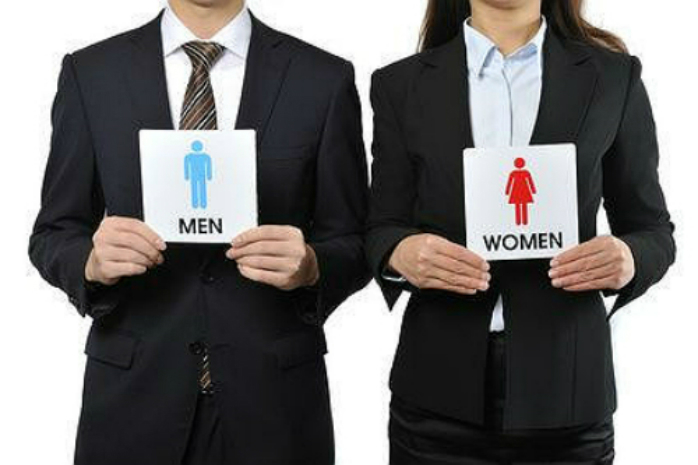 Talking of gender gaps, a recent report highlighted at CNN Money that caught my eye has revealed while the usual disparity between the pay of men and women remains, the millennial generation might be helping to close the gap. The report says that while at present, the higher up the executive ladder you climb in the U.S. the more the male to female wage gap grows, the gulf seems to be shrinking amongst the younger up and comers. The overall median wage gap between men and women is estimated at 2.2 percent for millennials, compared to 2.7 percent for boomers and 3.6 percent for Generation X. At the executive level the millennial gap stands at 4.9 percent, compared to 6.2 percent for the boomer generation, and 7.4 percent for Gen X. While there is still work to be done to eradicate the gap, the disparity, which, interestingly enough grew as Gen X moved through the workforce, does seem to be reversing. The Deloitte report reveals a number of dynamics at play as millennials enter the workforce – differing views not just between the new intake and their managers, but also within the millennial cohort itself. Understanding how millennials think, understanding the differences between male and female behavioral tendencies when it comes to promotions and self-assessment, understanding how to motivate, inspire, retain, and mentor them are all important components of building strong teams within your organization. This is especially true if you’re building, leading, and managing IT teams. Men might rate themselves more highly when it comes to technical skills, but we all know that women are very adept at tech as well. Equally as important, women tend to be great communicators, creative thinkers, and really good at teamwork. Those are all things that any IT leader knows are integral to serving the needs of both an organization and its customers. Another key takeaway for you as a manager is to understand that if you’re looking to fill a position within the organization, don’t assume that because a woman doesn’t apply that she’s not interested. She might be the best-qualified member of your team for the job, she just doesn’t know it, or she doesn’t think she fits all the requirements to a T. That’s when knowing your people, and their individual strengths, can allow you to gently push them in the direction that would not only be most beneficial to the team as a whole, but fulfilling for them as well. I love writing about millennials and the future of work. It’s fascinating to get a glimpse into how this new generation thinks and acts and how their priorities are in many cases very different than that of predecessor generations. It’s also fascinating to be a part of the conversation as to how multi-generational workforces can work most effectively together and to watch these powerful dynamics play out and shape the future of the business world. What do you think? If you’re a millennial in the process of navigating your career, what do you think of the data points mentioned here? Are they accurate when it comes to describing how you think and/or your experiences? If you’re a leader and manager of a millennial workforce, what are your thoughts and experiences? We’d love to hear from you. If you would like to learn more about this report from Deloitte, then you can download the executive summary and an infographic summarizing the main gender gap statistics.